Tallangatta, a rural town in north-east Victoria, is on the southern shoreline of an arm of Lake Hume, 30 km south-east of Wodonga. Present day Tallangatta dates from the 1950s, and the original township was 7 km east and is now shown on maps as Old Tallangatta. In 1838 pastoralists from New South Wales took up the Tallangatta pastoral run. It is thought that the name was derived from an Aboriginal word describing currawong trees. Tallangatta (that is, Old Tallangatta) stood at the junction of the Mitta Mitta River and the Tallangatta Creek, an area that was poorly drained and ultimately was inundated by the Hume Dam (Lake Hume). A hotel was opened in 1856 and, as farm selections were taken up, a school was opened in 1871. During the 1880s there was tin smelting from ore mined at Koetong about 20 km east. In 1889-92 the town gained numerous amenities: an athenaeum and Methodist and Presbyterian churches (1889), an Agricultural Pastoral Society (1890), an extension of the railway from Wodonga (1891) and a butter factory (1892). In addition the local Towong shire (1874) which had alternated its offices between mining towns, settled on Tallangatta as its administrative centre, and in 1891 built a handsome brick shire hall on a rise in Tallangatta. Tallangatta was a railhead for taking livestock to Wodonga from 1891 until 1921 when the line was extended further east, and despite the extension it continued as a shipping point for the Mitta Mitta valley. The town’s population increased from 510 to nearly 900 people (1901-11). A private hospital was replaced with a publicly funded building in 1914 and in 1921 a Soldiers’ Memorial Hall was built. As a result of the federation of the Australian colonies in 1901 the River Murray Commission was formed and in 1916 the Commission chose the junction of the Murray River and the Mitta Mitta River as the site of a major water storage (Lake Hume). At first the capacity of the storage was planned to fulfil the needs of river navigation and irrigation, and the town was to be inundated. However, as navigation declined the storage was reduced, and in 1936 the completed Hume Dam left Tallangatta untouched. Further irrigation growth ensured enlargement of the dam and after World War II planning began. Old Tallangatta had two parts, the township and a housing area across the Tallangatta Creek on a rise. It was colloquially known as Toorak. The decision about where the town should be moved alternated between ‘Toorak’ and a more elevated spot, 7 km west overlooking Lake Hume. There was a possibility that a further enlargement of Lake Hume might cover Toorak and the westerly place was chosen. It was the Bolga station on the Tallangatta railway line. (In the event enlargement of the water storage was transferred to Dartmouth and no third stage for the Hume eventuated). 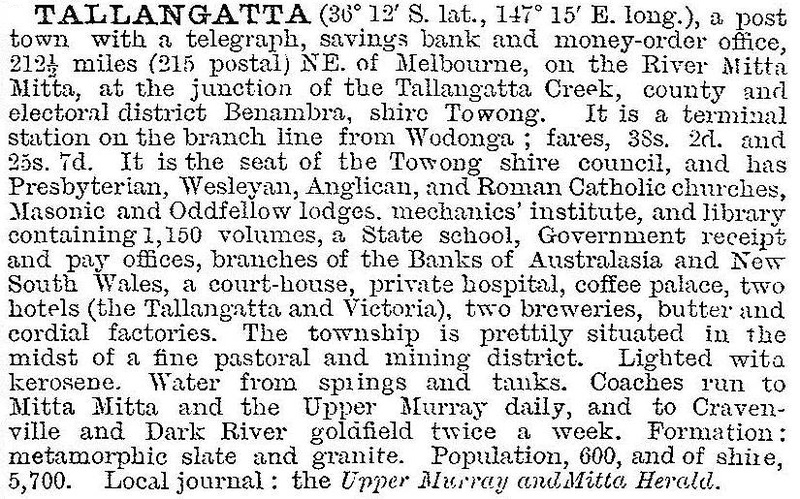 The new Tallangatta was a planned township of the 1950s. Sewers and water reticulation, a conspicuous deficiency in old Tallangatta, were brought forward. The first of several weatherboard buildings were transported to new Tallangatta and refurbished in 1954, and the town was officially opened in June 1956. Residents were apprehensive about the move, and considered that its imminence had held back growth. Watching the waters rise over remaining old buildings caused some anguish, and occasional dry spells later caused the Lake’s water level to drop and reveal the town’s skeleton. Tallangatta’s facilities were nevertheless replicated in the new site. There are a hospital, golf tennis, bowls and swimming facilities, a memorial hall, a secondary college (1961), State and Catholic primary schools, Anglican, Catholic, Presbyterian and Uniting churches, a showground, two hotels, and a shopping centre. The townscape retains much of its 1950s architecture. There are public reserves in the town and a linear reserve along the shore line of Lake Hume. Each year in March the showground hosts a large regional agricultural and machine gathering, and the railway line (1891-1981) has become a cycling and walking trail. Tallangatta’s weekly newspaper is published by the secondary college which had 430 students in 2014. The brick offices of Towong shire were demolished at old Tallangatta, and have become a site of historical note. The new offices in Tallangatta have remained the administrative centre for the local shire, the result of a merger in 1994 between Upper Murray shire and Tallangatta shire (formerly Towong shire). The merged shire reverted to the named Towong. Several State Government offices were closed in the mid-1990s as facilities were centralised in Wodonga. However, construction commenced in 2014 on a new library as part of a community hub that would include an eco-educational centre, community services lounge and resource centre, IT portals, kindergarten, long day care centre, maternal health and provision for Council and other business services as part of the Tallangatta Tomorrow plan.